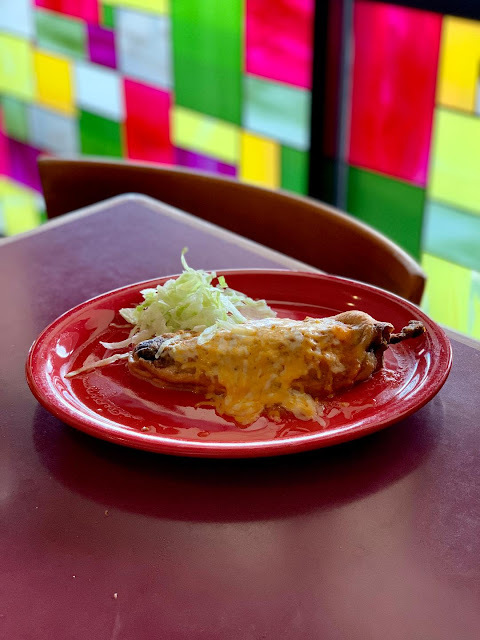 One of Ed's favorite Mexican dishes is the Chile Relleno. Where he grew up in Texas, they used to stuff the chiles with ground beef. But in all of our travels, we never find anything but cheese-stuffed chiles. So that's what he gets. This one was made at one of our local Mexican restaurants, one we don't go to nearly enough. It's called Mosaic Cafe Dos. The place is small and the food is delicious. They hand make flour tortillas on site, and if you get there at the right time you can get them fresh off the griddle. They're amaaaaazing! There's definitely no shortage of good Mexican food in Tucson!